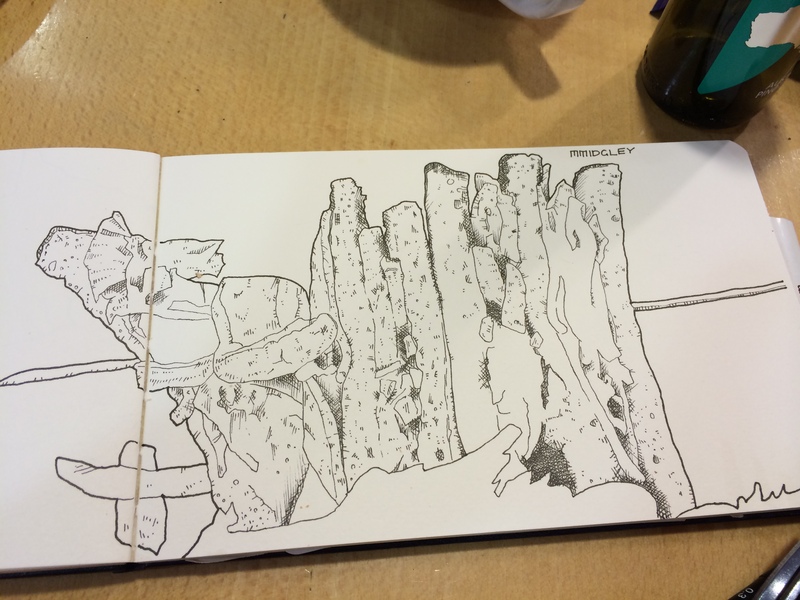 A first meal sketch – well, not really ! 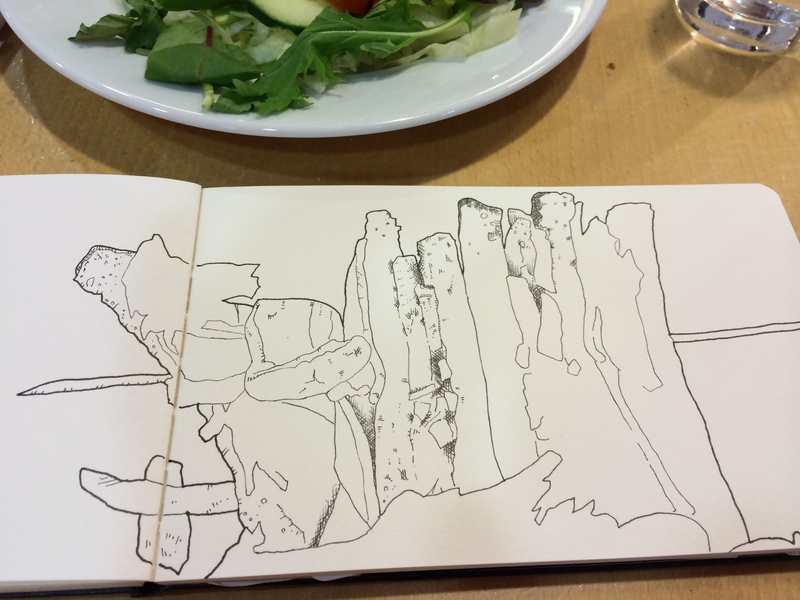 This was the first sketch I did of a meal – well, not really ! 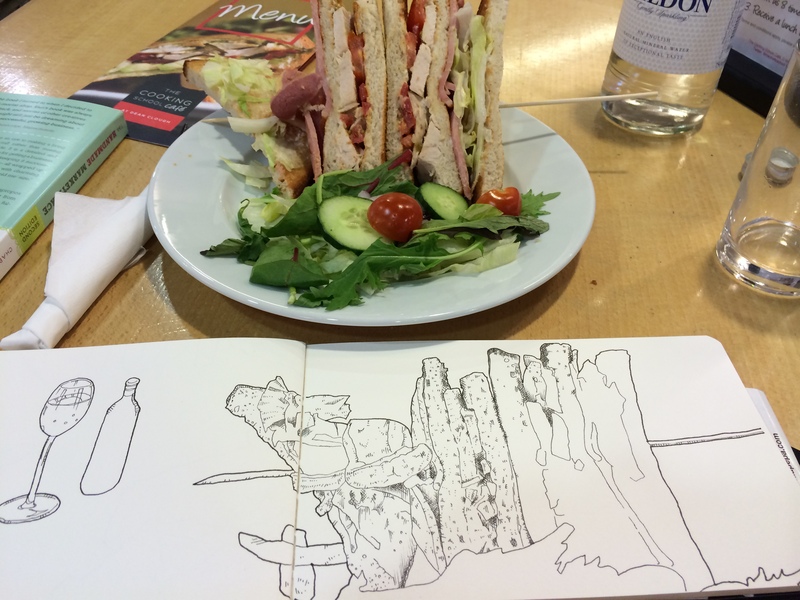 I’d drawn my food before, but this was the first time I’d drawn it in a dedicated book. 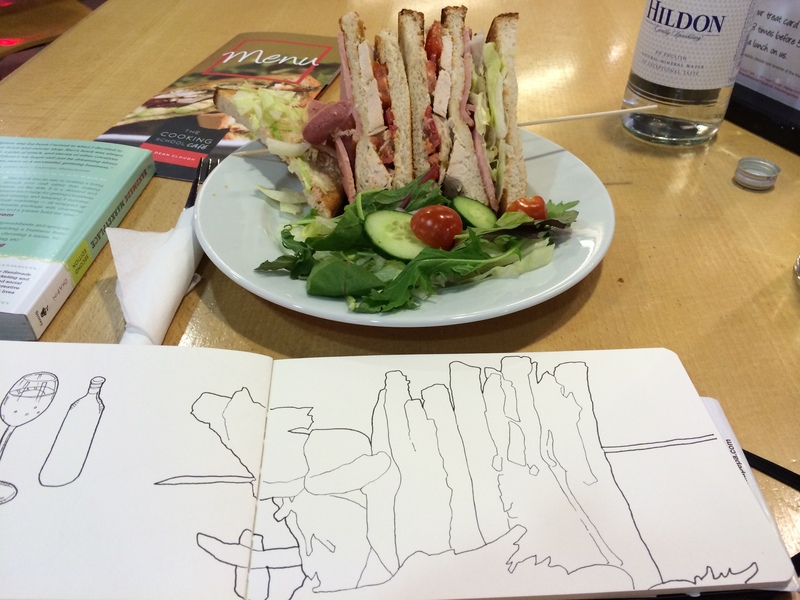 That weekend of drawing my meals included a couple asking to take my photograph drawing my meal (That’s not happened since! And I soon wish I’d asked them to send me a copy of the photograph!) and also a family interrupting my drawing to tell me that they were fans of my drawing in the camping magazine. Neither of those two things has happened since. 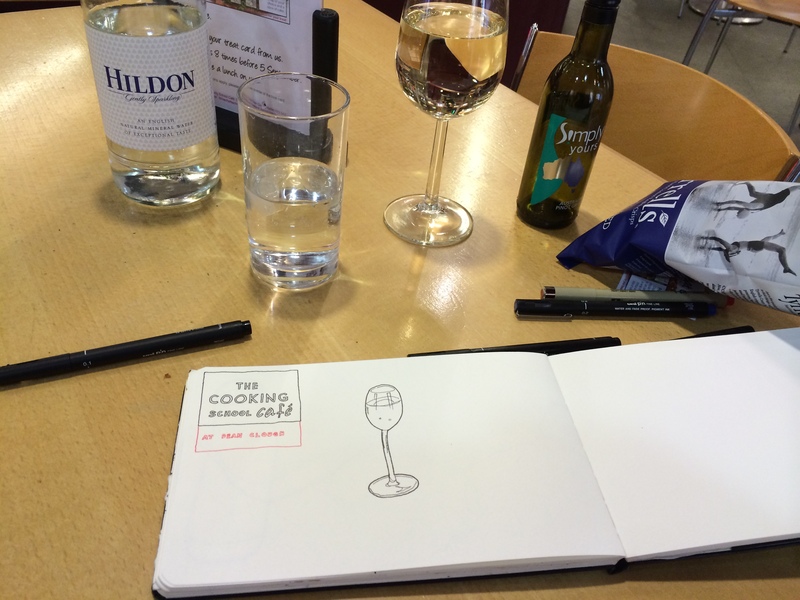 The Cooking School at Dean Clough , in Halifax, is a wonderful place; it trains chefs in the cookery school and gives them practical experience in different roles within the attached cafe. The cookery school is also a school for leisure cooks and offers a year long range of cooking courses on a wide range of themes. It also runs junior cookery events too; which is where I’ve dropped Lucy off to. 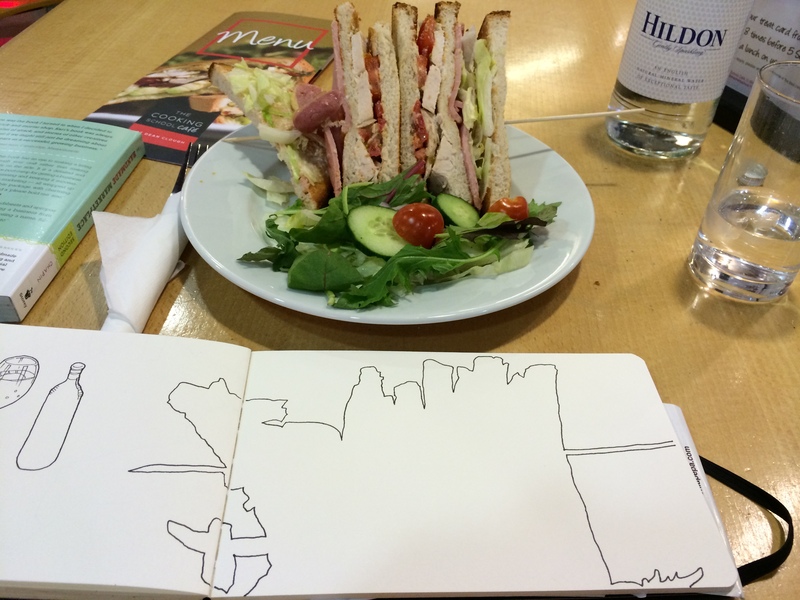 This club sandwich was erred warm; although it cooled somewhat by the time I got to it! I’ll pop in again and have it warm, sometime. Staying down in Dorset means we can stop off at the delightful village of Wimborne. We nipped into No.9 on the Green for a light lunch; where I discovered the pleasure of Pea mayonnaise! 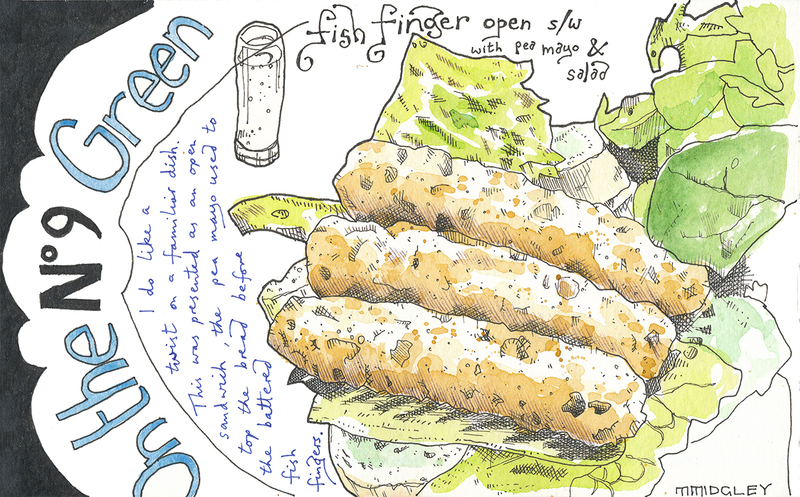 Coupled with the fish fingers this sandwich offered a pleasant variation on fish, chips and mushy peas. Makes a pleasant accompaniment to any fish based dish. A light (and wholly vegetarian) sandwich at this quaint little village cafe in Derbyshire. More in their design and organisation than their actual contents, though. I’m fascinated by the way that some restaurants and cafes organise the various options available to the customers. I suppose this figures more for cafes which offer a selection of different sandwich options, for example. There being so many different combinations available. The Harland Cafe in Sheffield had a most interesting menu board; allowing customers to close from breads and a variety of fillings to create their own sandwich. And I suppose Subway aims to allow their customers a similar range of choices. It would be an interesting task to design a customer friendly menu offering as wide a range of components as possible. 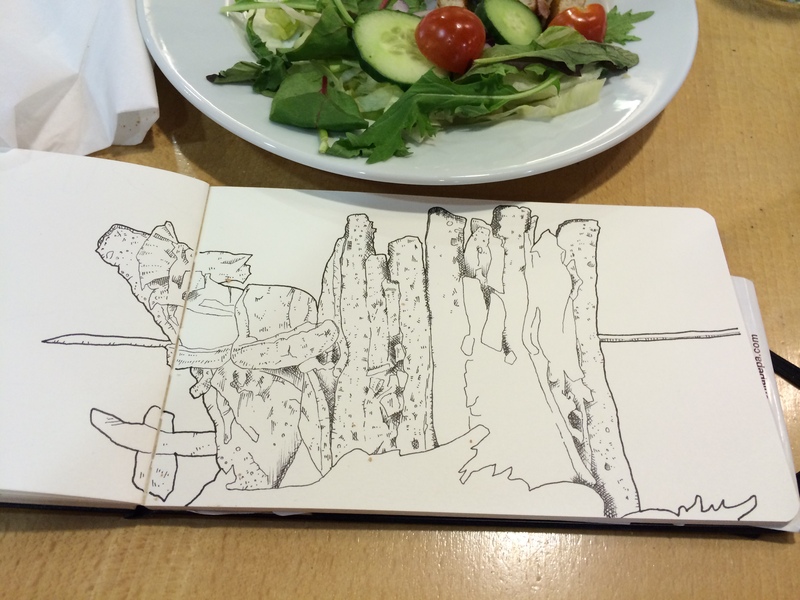 Focussing on drawing my meals out has certainly opened my eyes to many eating habits and foodie choices. Strangely, though, one things I love to do, which mixes this up, is something I’ve actually done for years, long before I started drawing again. At first they were rather reluctant. Just as I, as a customer, am used to striding in and checking the menu board for my default sandwich, so the deli assistants are used to only having requests barked at them. Who cares what they think? Which are you most proud of? That day, instead of having a ham and cheese sandwich on brown bread, I had a Bacon and Brie Croissant. Today I received a Pastrami sandwich with Saurkraut. Peppery and sweet. I sat in the park, on the edge of a wall, balancing my can of Pellegrino, while I watched the other office workers chatting and enjoying the summer sunshine on the grass. If you enjoyed this post, or my illustration, please feel free to comment and/or share it with the social media channel of your choice. and I dare you to ask that waiter or waitress for their choice the next time you’re having a meal out. When you’re growing up you get used to certain things. And assume, understandably, that everyone is familiar with those things. For instance, at the moment I’m drawing a a spread about popular biscuits. This would probably be pretty unfamiliar to anyone not from the United Kingdom, although American imports, such as Oreo Cookies are invading our shelves, I’ve tried to keep the illustration to traditional British biccies. Merrie England -is a set of local teashops. Now when I say local, I really do mean local. There are about eight or so of these cafes and they’re all localised around Huddersfield. It wasn’t until I travelled further afield, as I grew older, that I realised that Ye Merrie England was only a Huddersfield delight. Now, I hasten to add that they have a bit of a make-over in recent years and are looking a little more modern, but have still pretty much retained the quasi-Tudor look. The atmosphere is nice and friendly and there are clearly lots of regulars strolling in for breakfast. I woke up to a breakfast roll and a nice cup of tea. Bacon, sausage and a runny fried egg. It must be a runny fired egg in a sandwich – ready to pop once I bite into it and then run round the bacon and sausage. Hopefully dripping onto my plate, so I can mop up the egg yolk with my sandwich. Baxter’s Sandwich Shop – Christmas Lunch in a Sandwich! The sandwich shop closest to where I work has been serving these little beauties for the past three weeks, or so. How could I possibly resist?! 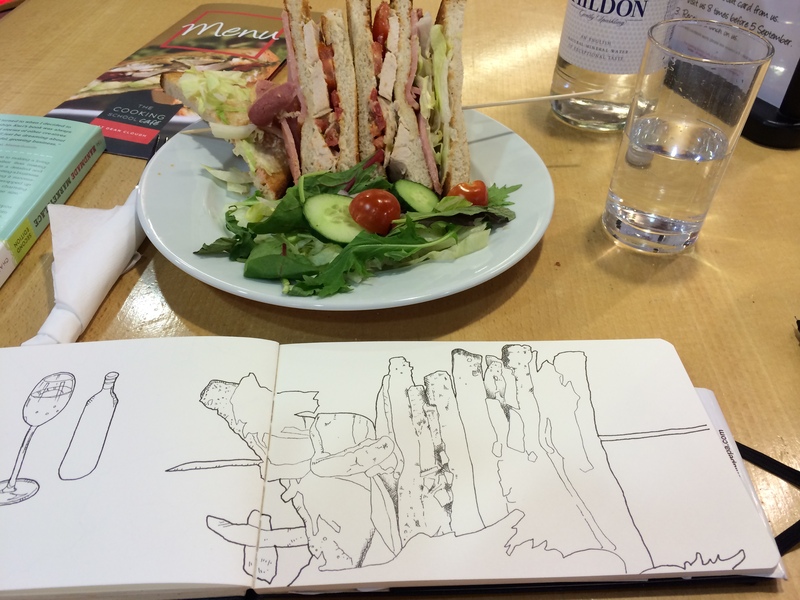 Now, I realise that this isn’t the most inspiring foody drawing I’ve done; but it’s certainly one of the tastiest sandwiches I’ve had in a long while. Let’s just have a run through those ingredient, shall we? All it needed was a paper hat and a crumby joke to top off the effect. I added Prawn Cocktail crisps as a starter. Well, it is Christmas!